Awnings are a great addition to residential outdoor spaces as it works great in adding protection from sun and rain as well as provide a stylish element. At Hunter Canvas, there are a wide variety of awnings to choose from and a seemingly simple task of choosing one can turn out to be quite daunting. As you may already know, awnings come in different shapes and sizes. However, they fall broadly into two categories: stationary and retractable. If you are looking for an awning for your deck or window, retractable awnings are recommended since you can easily reel them in if you want to enjoy a bit more sun or easily roll it out when the rain comes. On the other hand, stationary awnings are ideal for entryways. Awnings are generally measured in projection and width. Projection refers to how far your awning can extend from the wall. To measure this, determine where it needs to reach. Keep in mind that you need to factor in the fact that awnings tend to slightly drop as they extend out. For the width, measure the space between existing mounts, or for window installation, measure the width. Awnings at Hunter Canvas are available in different materials such as vinyl, cotton, aluminium and polyester. For deck awnings, cotton is a popular choice, which can be painted to a specific colour preference and to make it waterproof. For regions with stormy weather, aluminium awnings provide better protection, especially against high winds and hail. 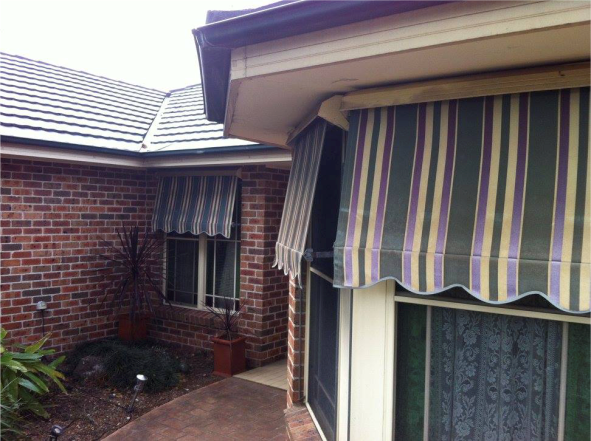 Among the different materials available, vinyl and polyester awnings are popular choices since these are waterproof and are widely available in different patterns and colours.